Let’s start with albums for Canadian stamps. There are many inexpensive albums such as the Junior Canada album, the Constitution Canada album, the Tradition Canada album, and the Harris Canada & Provinces album. These four albums range in price from $39.55-$69.95** plus taxes. 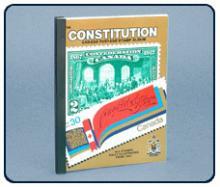 They are excellent for beginners or for someone who has a limited Canadian stamp collection. The major difference between them is the amount of pages they have and the amount of stamps they can contain. For an intermediate collector who is interested in collecting stamps from the provinces and not spending too much, the Harris Canada album is the one to get since the others mentioned above do not necessarily have these issues. Also, the Harris Canada album has a $125 value, but is being offered at the special price of $69.95 plus tax for a limited time. The Junior Canada album is nice album for younger ones since, as the name implies, it contains the illustrations for stamps which would be most appealing to youngsters, such as flowers, animals and other themes. It costs $39.95 plus tax. All of the above can be filled out with additional blank pages. More serious collectors have other needs. They are often looking for the most comprehensive album they can get for the money. 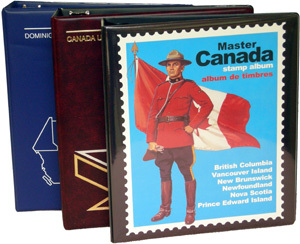 The well-known Scott Master Canada album can cost about $325 for the two volumes covering the years 1851-2004. Subsequent years cost approximately $27.50 per year per supplement, with the binders coming in at $19.95 each. So, for a complete album (which is in black and white) until 2008 you would be paying around $435.35 plus tax. A hitch however: Volume 1 for the years 1855-1997 is discontinued. The only way to get it now is to search for someone selling a used one, or one purchased some time ago. 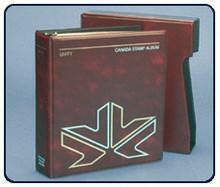 So, if you were prepared to invest that kind of money, a very interesting choice would be the Unity Canada album. It is a three volume album which is very complete and covers the years 1851-2007 for a cost of $277.35 plus tax, which is less than the Scott Master would have been brand new. An extra supplement for 2008 comes in at $27.50 plus tax. The bonus for buying this one: it is in full colour! The page shown at far right well illustrates how attractive this album is and well worth its cost. It is also possible to purchase a slipcase to store your individual albums in, thereby ensuring that they stay upright in your bookcase! We must say that at Arpin Philately this is one of our most popular albums. 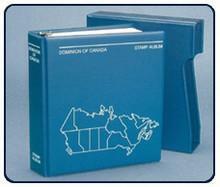 Another economical choice: the Dominion Canada album. It is also a three-volume album for a little less than the Unity since it is in black and white. It would run you $238.30 plus tax, complete until 2007, with the 2008 supplement costing $24.95. 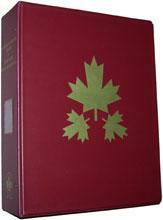 The Unity Canada and Dominion Canada album are both printed on medium-weight paper, an important fact when looking for something that will survive being handled for many years to come. Both of these albums are also available in French. We hope this helps you in making a wise choice. Do you have a favourite album or a comment to make about any of the above which would help out prospective buyers? We would be very interested in hearing your ideas and sharing them with our readers. Next time: we will examine the choices in albums for collectors of USA stamps. Just want to know if some of those albums have ‘mounts’ brackets in it?? None of these albums are pre equipped with mounts, but they can be added when needed. Please note that an album with mounts or hingeless would easily cost 5 to 10 times the price of these albums. 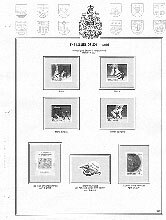 Does the Harris Canada album you have on special of $70, come with all pages up until 2010, and are there black and white pictures of the stamps? This seems like a very low cost album when you consider what supplements cost. Bill, this special was in effect in 2009. The Harris Canada album is now issued in 2 volumes, complete to 2010 and fully illustrated in black and white. The current price is $99.95. Follow this link for complete details. 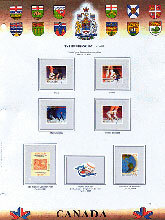 Harris Canada stamp album. Are these albums all acid free? How does the page weight of the Harris Album compare to the Unity and Dominion? I see very little mention of stock pages etc. being acid free and this is of concern. Thanks in advance for your reply. The Unity and Dominion albums use medium weight acid free paper while the Harris Album uses a much lighter paper. I am not sure if the Harris paper is acid free, I will contact the manufacturer. Thankyou Daniel. I have saved stamps for years, but now that I have some time to actually do something with them, I am surprized that all products are not acid free. i look forward to your response. Hi Daniel. Still waiting to hear if the Harris Album is acid free. Personally, I do not like the looks of the Unity pages. I feel that the coloured pages takes away the effect of the stamps. I would like to purchase a stamp book that holds stamps from 1977 to 2012 Where would I get this album? Do any of these albums have all the rare entries in them or are they omitted like the cheaper albums do? Also can a person not just get a complete canada album set regardless of price? Thank you Daniel. I appreciate your quick response. I will check out this link. Have a great Christmas. Again my thanks.